RAdio Detection And Ranging was an original active microwave sensor that became widely operational with the onset of World War II. (1) emission or transfer of energy in the form of electromagnetic waves (2) the process by which electromagnetic radiation is propagated through free space by virtue of joint undulatory variations in the electric and magnetic fields in space; this concept is to be distinguished from conduction and convection. instrument intended to be carried by a balloon up through the atmosphere, equipped with sensors to measure one or several meteorological variables (pressure, temperature, humidity, etc. ), and provided with a radio transmitter for sending this information to the observing station. deformed sea ice in which one piece has overridden another; also called telescoped ice. a process by which currents or winds push around thin ice so they slide over each other; also called finger rafting. a horizontal underwater projection of ice from an ice front, ice wall, iceberg or floe. a fissure that separates a moving glacier from its headwall rock; like a bergschrund. radiosonde which is tracked by radar or radio-theodolite to measure the wind aloft. a glacier that is reconstructed or reconstituted out of other glacier material; usually formed by seracs falling from a hanging glacier then re-adhering; also called reconstructed glacier, regenerated glacier, or glacier remainie. a glacier that is reconstructed or reconstituted out of other glacier material; usually formed by seracs falling from a hanging glacier then re-adhering; also called reconstituted glacier, regenerated glacier, or glacier remainie. 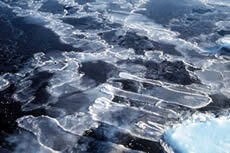 irregularly shaped areas of persistent open water that are sustained by winds or ocean heat; they often occur near coasts, fast ice, or ice shelves. algae common on temperate glaciers and perennial snow; its red color sometimes prompts people to call it watermelon snow. Provides the user the ability to convert the data from its native format to a different format. 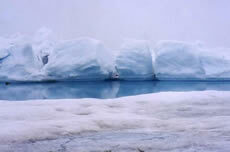 motion of an object through ice by melting and freezing that is caused by pressure differences; this process allows a glacier to slide past small obstacles on its bed. a glacier that is reconstructed or reconstituted out of other glacier material; usually formed by seracs falling from a hanging glacier then re-adhering; also called reconstituted or reconstructed glacier, or glacier remainie. The ratio of the absolute error in a measurement to the size of the measurement. the (dimensionless) ratio of the actual vapor pressure of the air to the saturation vapor pressure; usually expressed as a percent, and can be computed from psychrometric data. the relative permitivity of a soil is the ratio of the permitivity of the soil to the permitivity of a vacuum. a layer of ground, now perennially frozen, lying immediately below the modern active layer; its thickness indicates the greater annual depth of thaw that occurred during a previous period. ice formed in, and remaining from, the geologically recent past. permafrost existing in areas where permafrost can not form under present climatic conditions; reflects past climatic conditions that were colder. Provides the user the ability to convert the data from its native reference projection to a different reference projection. the effective stress generated in a thawing soil if no volume change is permitted during thaw. a layer of thawed ground between the seasonally frozen ground and the permafrost table. the cryostructure in which horizontal and vertical ice veins form a three-dimensional, rectangular or square lattice. a network of horizontal and vertical ice veins forming a three-dimensional, often rectangular or square lattice. the cryostructure in which horizontal and vertical ice veins form a three-dimensional, irregular rectangular lattice. when a mountain glacier's terminus doesn't extend as far downvalley as it previously did; occurs when ablation surpasses accumulation. a glacier whose terminus is increasingly retreating upvalley compared to its previous position due to a higher level of ablation compared to accumulation. a slope failure resulting from thawing of ice-rich permafrost. in meteorology, an elongated area of relatively high atmospheric pressure, almost always associated with and most clearly identified as an area of maximum anticyclonic curvature of wind flow. piled ice formed by ridging. process that occurs when wind, ocean currents, and other forces push sea ice around into piles that rise and form small mountains above the level sea ice surface; ridges are initially thin and transparent with very sharp edges from blocks of ice piling up; also see keels. a white or milky and opaque granular deposit of ice formed by the rapid freezing of super-cooled water drops as they impinge upon an exposed object; it is denser and harder than hoarfrost, but lighter, softer, and less transparent than glaze. corrugation on a snow surface caused by wind (as on sand).